Happy Holidays, my lovely blog readers. I hope you are taking lots of time to do things you love the most with the people you love the most. I am so thrilled to celebrate with family and friends this year. I wish you health, happiness, joy, music, love, and Toblerone Cookies. 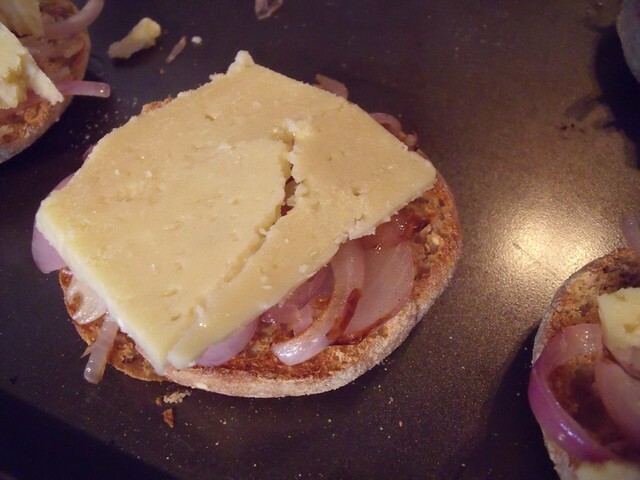 There’s not really a lot to it, which makes this a great weekday breakfast. We’ve had them twice this week already… and can’t stop. 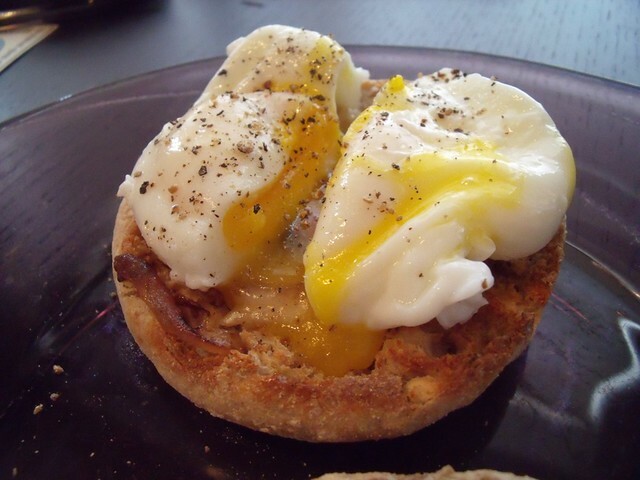 Essentially, you take an English muffin and toast it, layer it with veggies and possibly melty cheese, and then top with a poached egg. 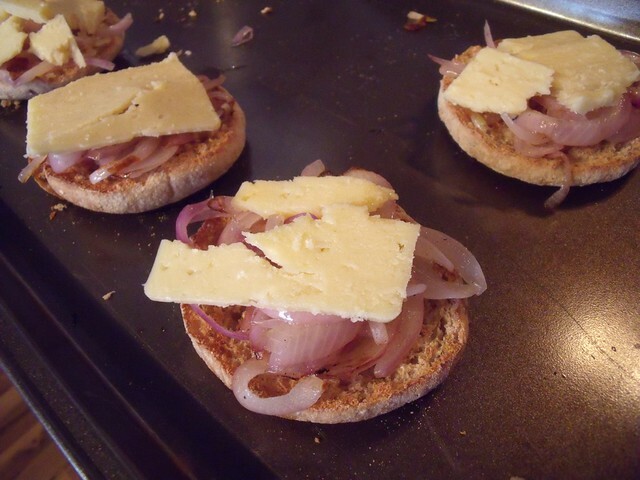 Our favourite combination right now is sauteed red onions and old cheddar, so I’ll share that recipe with you here. Also good: spinach and/or sauteed mushrooms. Yes. I’m also tempted to try kale… has anyone braved it yet with poached eggs? The secret here is perfectly poached eggs. I’m finding that 2 minutes in the poaching pot is perfect for whites that hold themselves together and yolks that run all over your muffin. To me, that is the best part. If you need an egg-poaching tutorial, I’ve also got one for you here: How to Poach an Egg — happy holidays, my gift to you! So if you’re looking for a good excuse to learn to poach eggs, this is it. 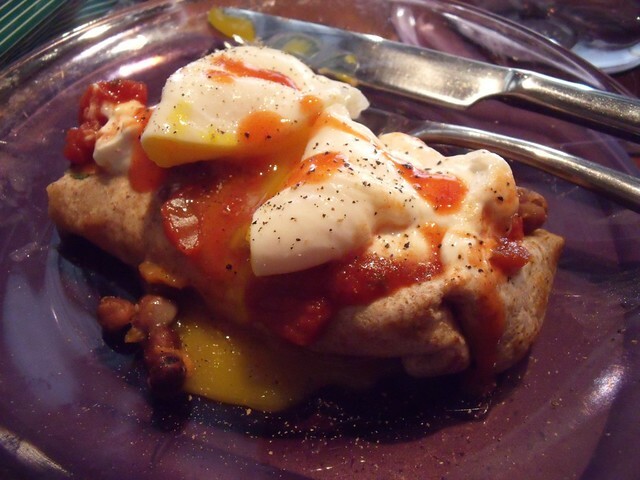 And if you need yet another excuse, just think — you can put poached eggs on top of leftover enchiladas too! We made a variation of my Kale & White Bean Enchiladas this week with fava beans, and they were even better as breakfast leftovers! Just remember to add the hot sauce. 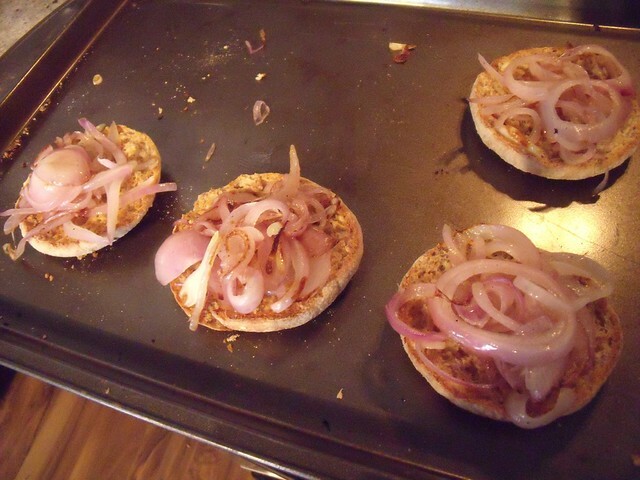 But back to Egg Muffins! I’ve scaled the recipe here for two people eating 2 eggs (and 2 muffin halves = 1 English muffin) each. But you can scale it however you’d like. I’ve recently been doing 2 eggs for the boyfriend and one egg and one cheesy muffin for me. Yum. Fill a large pot with water and place on the stove. Bring to just-before-a-boil, where you have tiny bubbles all over the surface of the water. 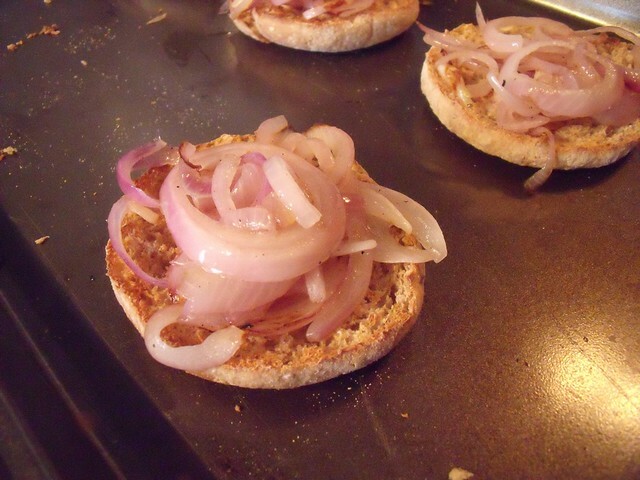 While you are waiting for your water to heat, toast your English muffin halves on a baking sheet under the broiler. By this time, you’ll be ready to poach your eggs. Stir your water with a frenzy, into a whirlpool of swirling water. 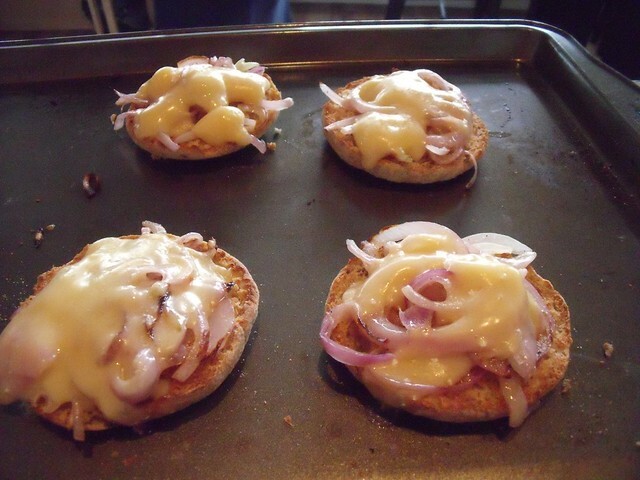 Drop in your eggs one at a time and let the water swirl them into cohesive little egg parcels. 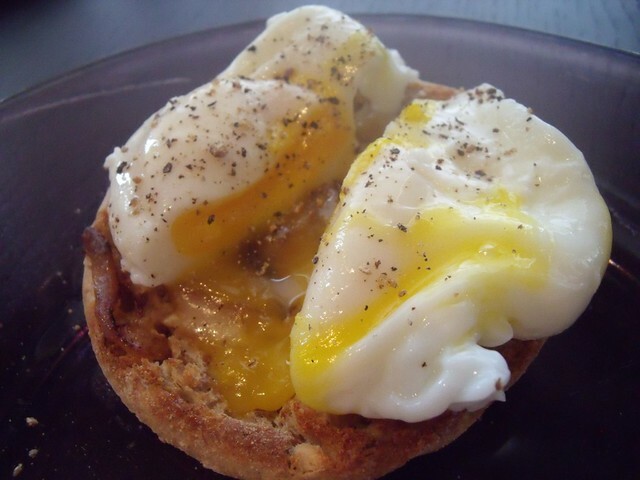 Poach for 2-3 minutes (2 for soft oozy yolks, 3 for medium yolks). Remove your poached eggs with a slotted spoon to a plate lined with paper towel to drain. 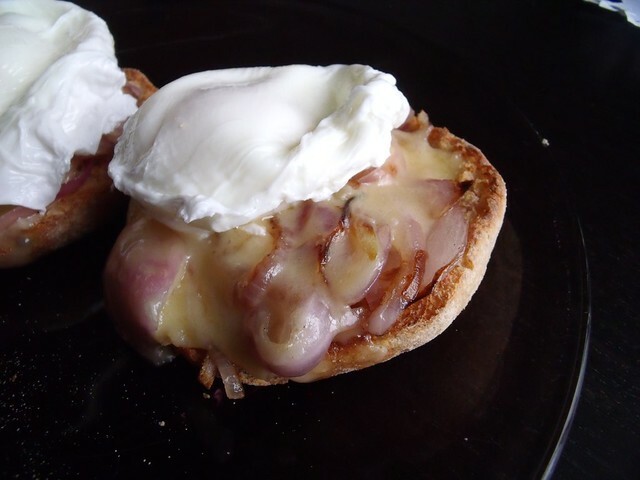 Lay a poached egg on top of each cheesy-oniony-muffin half and serve hot! 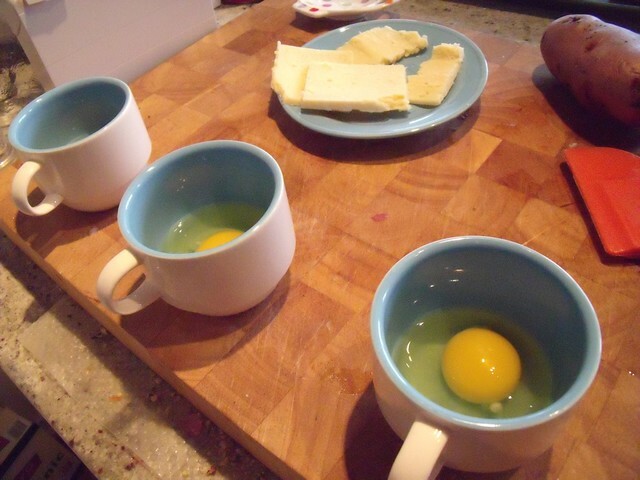 I like to cut into the Egg Muffins at this point in time, to get oozy yolks all over your muffins so they don’t go hard. Totally optional, you can leave this for the eater to do.